If I’ve been a bit quiet on the blog lately, it’s because I’ve been occupied with finishing the first academic experience of the semester. Because Oxford operates on a system of eight week trimesters beginning in October, American study abroad programs must improvise to compensate for the mismatch in credit load. My program — the Centre for Medieval and Renaissance Studies — solves this issue by scheduling an ‘integral’ course during the September of pre-term. After a week of lectures back in the beginning of September, we’ve been free to select our own research topics, bound only by the confines of European geography, 400-1750. That course ended last Thursday with the submission of our research essays and since then we’ve enjoyed a long weekend break of sorts. A number of our program have scattered across the continent — some to France, others to Ireland, and a few to Berlin. Bekah and I stayed on Great Britain, but did find time on Sunday to travel to London to take in a show. While I’ll be blogging about this weekend soon, there are several experiences I want to share first (even if that desire revolves mostly around my need to share pictures…). Henry set about renovating the palace in order to host his court of over 1,000 people. While the exact architectural timeline of the palace is too complex to rehash here, perhaps the most iconic Henrician addition was the Great Hall. The Tudor years at Hampton saw a number of storied events. 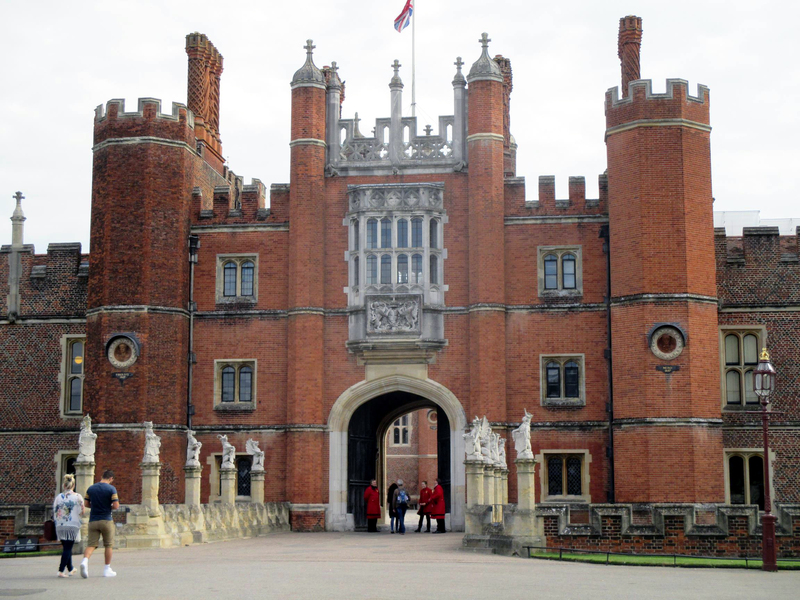 Most of Henry VIII’s ill-fated marriages took place at Hampton Court, the future Edward VI was born in the palace, and Jane Seymour’s heart is buried there. After Edward’s early death, Mary used the palace for her honeymoon; Elizabeth in turn occupied the buildings during her reign. 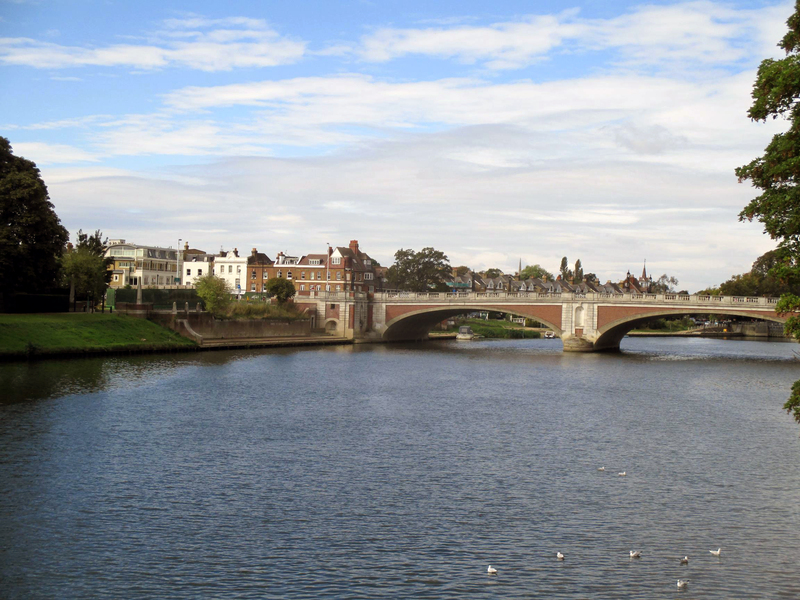 Stewart followed Tudor when James VI of Scotland became James I of England, but the English monarchs continued to use Hampton Court. It was there, in 1604, that the King met with a Puritan delegation and agreed to commission the King James Bible (subsequently released in 1611). 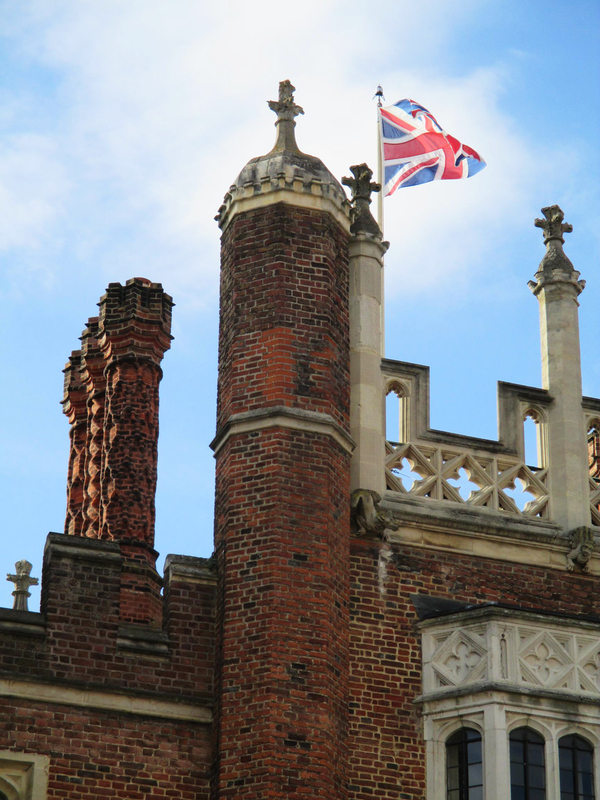 James’ son Charles I was imprisoned in the palace before his execution and after the English Civil War and the monarchal restoration, Charles II returned to Hampton Court (although he preferred to live elsewhere). 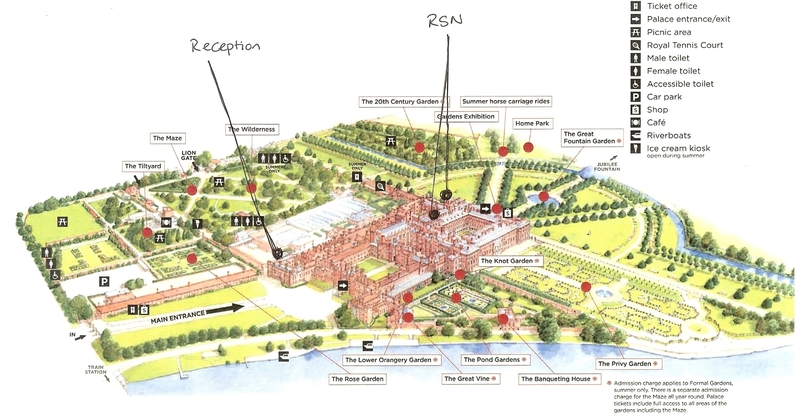 However, as a result of William and Mary’s rebuilding, Hampton Court straddled two vastly different architectural worlds. The front of the palace retained the original Tudor gates, walls, and buildings while the rear was cast in the emerging style of the 18th century, surrounded by sprawling gardens, and characterized by its use of light, colour, and inspiration from classical antecedents. The result is a palace in two halves: the front hearkening back to a Medieval past and the rear looking forward to the long 18th century. The contrast in style is abrupt and stark. After entering the grounds through the Tudor gate, proceeding through the Tudor courtyard and through the Tudor kitchens and cellar rooms, one emerges from a dark corridor into a sunlit Georgian quad. Heavy brick and stonework gives way to fleet columns and glass. Upon the Hanoverian succession which brought the grandfather of colonial America’s royal nemesis to the throne in 1714, the palace was occupied by George I and II in turn. George II in particular continued the renovations, expanding the refurnishing many of the interior rooms. But beginning with George III (the King of the American Revolution), no English monarch has lived in the palace. 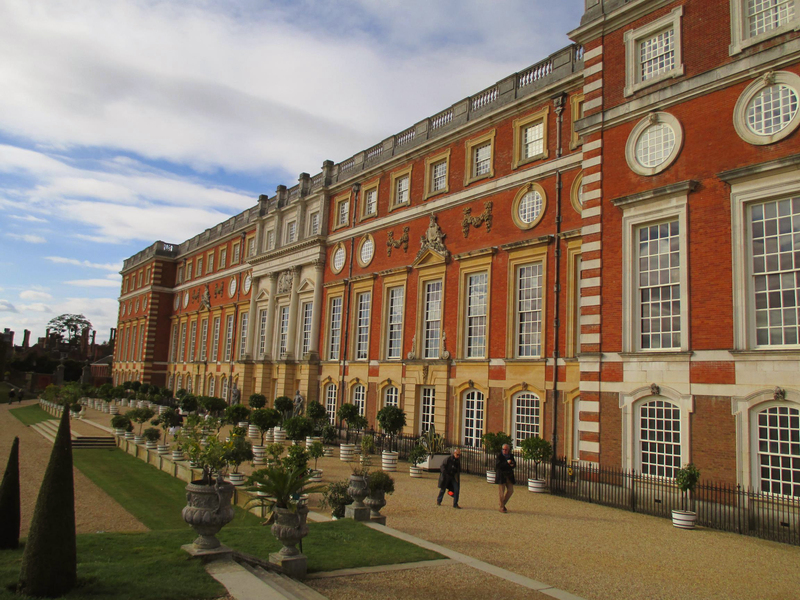 By mid-century, Hampton Court was turned over to the charity Historic Royal Palaces by whom it is operated today. The Tudor portions of the palace are dark and musty. The air is heavy and smells of old fires and roasted food — not an unpleasant smell. In contrast, the later portions of the palace lose this air entirely. After passing through the quad, one emerges into the rear gardens surrounding the palace. These gardens, modeled after an 18th century pattern, are extensive, sprawling across the entire length of the palace and many times its depth. It’s no wonder that the average courtier consumed between 4,500 and 5,000 calories per day! 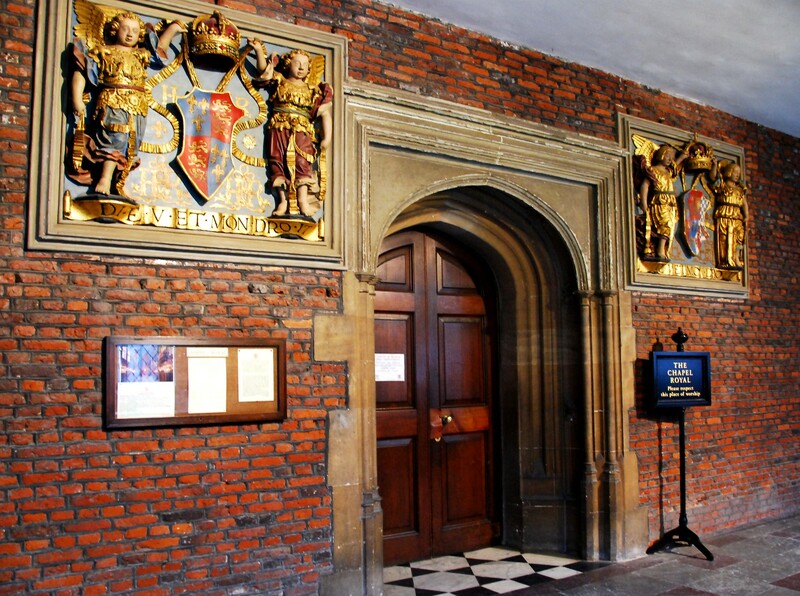 The chapel at Hampton Court was built by Cardinal Wolsey. Later, Edward VI was baptized there; Henry was married (several times) there; and Jane Seymour’s heart lies beneath the altar. The ceiling is original, a stunning example of Henrician architecture. 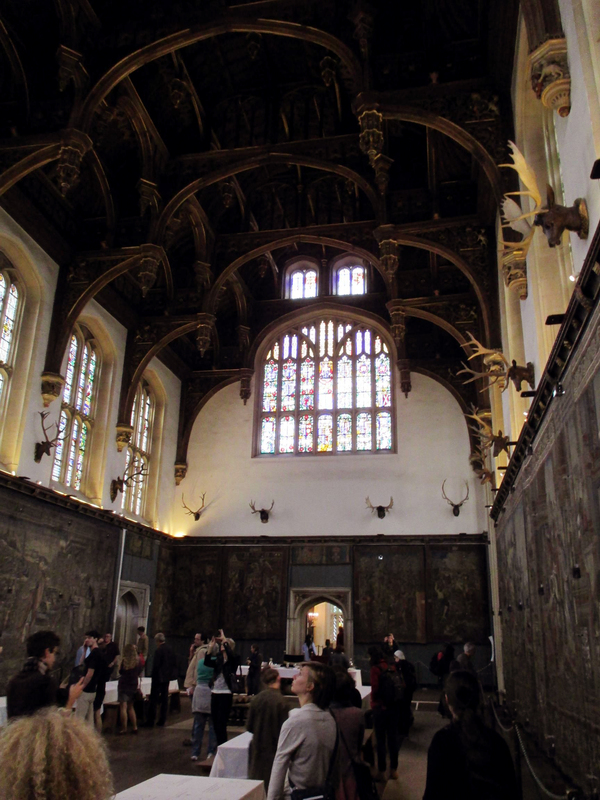 The English royal motto, “Dieu et Mon Droit” is emblazoned across the ceiling dozens of times. The translation — “God and My Right” — is as bold an assertion of royal prerogative as can be found. Under William’s rule, the chapel was renovated, during which time the wooden altar screen (designed by Christopher Wren) was installed. Photographs are prohibited; I’ve pulled several together from various websites (plus one I snuck). The official webpage for the chapel is also worth a browse. Towards the end of the trip, we explored the apartments of William of Orange. Among the last additions to the palace, the apartments offer a glimpse of late 17th and early 18th century life as a British monarch. The influence of the contemporary Palace of Versailles is evident, as much of what William hoped to accomplish with the renovations was in imitation of his French counterpart. …an earthy, dark, meaty, smell. Like feasting with King Arthur.